Knife offences in Lancashire have increased by more than one third over the past four years, police figures show. Across England and Wales, the number of fatal stabbings hit the highest level since comparable records began, more than 70 years ago. Labour MP Yvette Cooper, who chairs the Home Affairs Select Committee, described the findings as "shocking and deeply concerning". Lancashire Constabulary investigated 867 offences involving a knife or a sharp weapon between April 2017 and March 2018, according to the Office for National Statistics. That is a 34 per cent increase since 2013-14, when there were 645 cases, and a six per cent rise over the last year. There are 58 knife offences per 100,000 people in Lancashire, lower than the national average of 69 per 100,000. Nationally the most common offence involving a knife or sharp object was assault with intent to cause serious harm, followed by robbery. 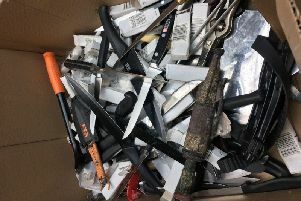 Diana Fawcett, chief officer at charity Victim Support, said: "We're now witnessing the highest ever number of knife-related deaths and it's deeply troubling that these rises are being driven by a huge increase in the number of young people whose lives are being lost to this epidemic. "These figures further highlight the need for all agencies to come together to tackle this increasing crisis which is destroying lives and shattering communities." The figures also show the number of offences involving a gun. In 2017-18, Lancashire Constabulary recorded 109 cases where a firearm was used. That’s five fewer than the previous year. However, across England and Wales, gun offences are at their highest level since 2010-11. The number of homicides in Lancashire dropped last year, from 12 cases in 2016-17 to 14 in the latest period. A homicide is a murder or manslaughter. Across the North West, the number of homicides increased by 43 per cent over the last year, to 136 cases. Policing and fire minister, Nick Hurd, said: "Tackling the impact of violent crime remains a government priority and it is crucial to stamp this out." Mr Hurd explained the Serious Violence Strategy targets early intervention against possible offenders. "We are investing a further £220 million in community early intervention projects and have made clear that all public bodies need to treat serious violence as a priority," he said. Mr Hurd added that the Government has proposed "the biggest increase in police funding since 2010".